Seamless mode of virtual machines could be improved. Virtual machine has advantages over host machines, though it is usually because of the users rather than the OS itself. Consider the case that you are using Linux as your host OS, but you would also like the the benefits from Windows, besides you get an licensed version. You might be using VirtualBox, or VMware products. They both have a seamless mode which integrates the guest OS into your host OS. This blurs the edge between the host and the guest. You might not notice that the applications are running on different machines. I could watch from Windows Media Player and update my Ubuntu at the same time. All seems good before you come to a keyboard-only guru. The 'Ctrl+Tab' simply won't work when you want to switch between host and guest. The focus will not be released, when it is captured by the guest, unless the 'host key' is pressed. This is not an idea 'seamless' mode, where even gurus will not notice the switching from guest from host. There are two possible trends of seamless mode for virtual machines on Linux. 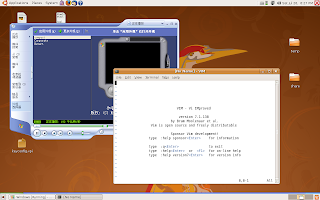 One is to make use of workspace on Linux. A workspace is like a separate root window on windows and the number of workspace can be changed by users. A virtual machine could use one entire workspace for the guest OS. This is especially convenient if the guest OS is a single workspace operating system. Another possibility is to make guest applications more like host applications. This is similar to Wine. However, one might still want to keep the original theme from guest OS. A 'seamless mode' is a very good start point for improved user experience. A screen shot of seamless mode of VirtualBox. What next? Cloud computing, mashup, or app engine. Cloud computing, Mashup, and App engine. It might be interesting to build a 'cloud' instead of building an OS. As time goes by, a TV set is no longer an expensive property. Although a computer ( the hardware plus many software bundled) is not as cheap as a TV set, it certainly will in the near future. Will these clouds in the future become OSes which we are now used to? It might be. It was once the era of hardware, and followed by software. It is now Internet and services.